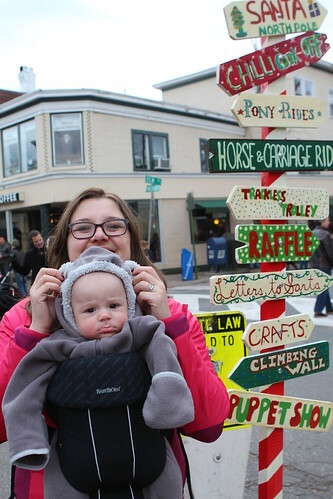 On Sunday we kept alive our tradition of going to all the children-themed festivals in town. On Sunday the event was the annual Mistletoe Festival. It's just like all the other festivals in town except that there is a Santa Claus and hot apple cider. The past four-and-a-half months have been great because, as opposed to the past, we've been able to bring the Wombats with us. In the past we've just sort of crashed these type of events by ourselves like weird pretenders. Now we have two babies who serve as All Access Passes to this type of event. Unfortunately it was a cold, cold day. Martin just sort of folded his arms in his carrier and squinted his eyes a little seeming to tolerate the cold. Elliott has this expression on his face the entire time whether or not the hood from his Tanooki suit was completely covering his face. The Mistletoe Festival was not a huge hit with the boys. We were there for less than ten minute. There's always next year. Last night things were a little different. 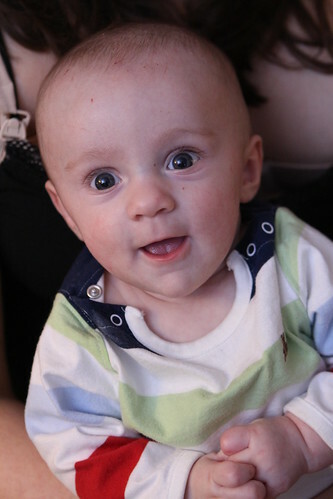 Martin was all smiles at the dinner table. Maybe it was because he got to join the grown ups for dinner. Maybe it was because he was wearing daytime clothes that his foolish father mistook for pajamas before being reprimanded by his mother when she returned home from work. At any rate he was a happy, happy boy. We were lucky enough to have a second Thanksgiving dinner on Friday and a catered lunch and dinner on Saturday. This made for our latest ever hot turkey sandwich dinner, the traditional day-after-Thanksgiving staple. Jen stuck with tradition, as always, with her sandwich consisting of two slices of bread stuffed with turkey and stuffing and covered with gravy. For my sandwich I bucked trends once again. Jen's father recently visited after passing through Montreal and brought with him a bag of Montreal bagels. Normally I leave these all for Jen as they are her favorite thing in the entire world. 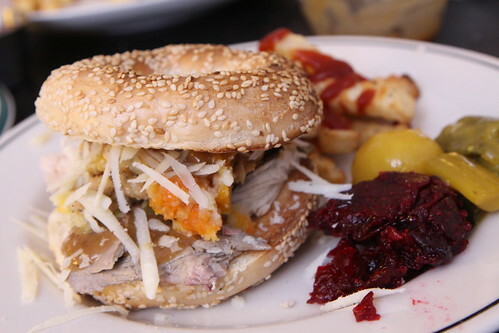 This time I hijacked a bagel to make yet another variation on the hot turkey sandwich theme. 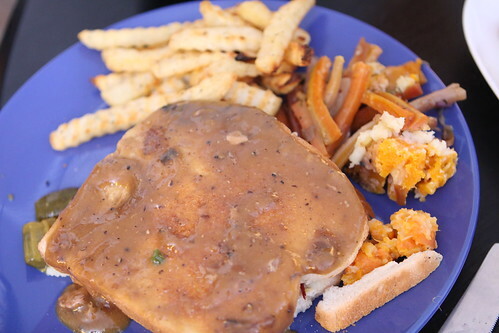 This year I toasted the Montreal bagel, stuffed it with turkey, carrots and turnips, mashed potato, stuffing, and gravy. I shredded some leftover Ouray cheese on top and served it with French fries, mustard pickles, and cranberry sauce. This may have been my favorite variation on the hot turkey sandwich themes to date. It had a few structural issues, such as the mashed potatoes oozing out hole with every bite, but it was worth the used napkins. I highly recommend if you can get your hands on some authentic Montreal bagels. Not very likely if you are not in Montreal but I'm just throwing it out there. 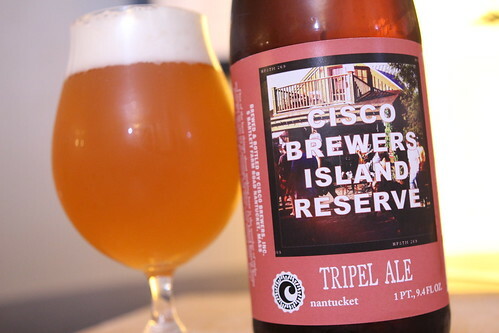 For beer I paired this Island Reserve Tripel Ale from Cisco Brewers. Tripels are one of my favorite beers to pair with turkey. Tripels are one of my favorite beers to pair with just about anything. Tripels are a favorite for any occasion. I'm a big fan of Cisco Brewers as well so I was thrilled when our Thanksgiving dinner guests brought this as a gift. It's been a little slower going in moving through our leftovers than years past. Luckily, next year, we should be able to feed some of the leftovers to the Wombats. I'm not really sure what one year olds can eat because I'm ignorant and too lazy to do the research. I'm assuming by then they'll be able to put down a giant turkey sandwich just like mom and dad. I know a lot about childhood development.